Detailed Information regarding Goodra’s Location and the strategy to encounter it in Pokémon Sun and Moon. You can catch a Goomy which is a Pokemon that will evolve into Goodra in the wild. Goomy will be summoned in SOS battles at Akala Island only when it is raining. Goomy will evolve into Sliggoo at Level 40. 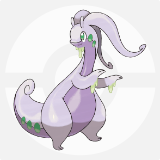 Sliggoo will evolve into Goodra at Level 50. Goomy will evolve into sliggoo on level 40. Sliggoo will evolve on level 50 when it rains. how do you evolve a sligoo into a goodra?